Buying a second-hand car is different to finding an antique Singer sewing machine at the thrift shop. Obviously – the value of the car will be significantly more, but a lot more planning, researching and financial preparation goes into finding your next pair of wheels. That’s why we’ve compiled a list of key points you need to remember when buying a second-hand car for the first time. What do you need the car to do? Does it need to get you from point A to B, drive the kids from school to sport practice, or perhaps something small for a first-time driver? We suggest that you keep your options open in terms of model, make and test drive at least 3 of the options before settling on one. Talk to people that drive the same model and get their honest feedback. It might just swing your choice in another direction! Now that you know what type of car you want, you need to sit yourself down and consider a realistic budget that won’t leave you feeling the financial strain. Consider whether the car might need some repairs now or in the near future. Can you afford this? Ask reputable dealers what a typical service will cost if the car is no longer under a motor plan. You might find that cars which are no longer being manufactured will have more expensive repairs or maintenance costs due to scares spare parts. Or the parts might only be available in bigger cities that are hundreds of km’s away. When you’ve found the car you like, be sure to keep your eyes open for any funny-business. If you’ve decided to buy through a private seller, research the seller before agreeing to meet up with him/her. Always meet in a public place and always take someone else with you (even if you’re a man). Get the peace of mind you want when buying a second-hand car. Did you know that the Roadworthy Test is a legal requirement and must be conducted every time a vehicle changes ownership? This is to ensure that the vehicle meets the safety standards defined by the SABS. Luckily for you, at BuyCentre we have a walk-in policy at our nationwide branches. That’s right, no appointments needed when you come to appraise your car! 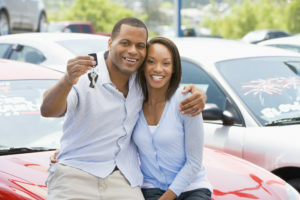 Buying a pre-owned car is usually a better investment than buying one new. Just make sure that you stay wary when buying a second-hand car, especially through a private seller!